NEW YORK, Sept. 9, 2014 –There are many advantages to renting a home: It’s a good way to experience a neighborhood before buying, is less expensive than staying in a hotel while your own house is undergoing a renovation and is an excellent first step to independence for college graduates.But decorating so the space reflects your personality and meets your needs? Let’s just say, it can have a few limitations. Landlords often prohibit structural changes and painting the walls or installing new light fixtures without specific permission, and even when asked, the answer is often “no.” Plus, few people want to spend a lot of money on updating a rental if they plan to stay for less than two years. What to do? Cheryl Dixon, Head of Brand and Trade Marketing for GROHE, the world’s leading manufacturer and supplier of kitchen and bath fittings, has some helpful ideas for renters. “Renters can personalize every room in the house without damaging damage the walls, floors or their bank account,” she says. Below, Dixon shares her room-by-room tips. The entrance to your home, whether it’s forever or a few months, should be inviting to everyone who crosses the threshold. When neglected, they’re narrow and dark, a space to walk through rather than enjoy and use. Spiff yours up by creating a tablescape on a narrow Parsons table or small, wall-mounted, demi-lune-shaped shelf with a small dish for keys, a tray for mail, a lamp or candles. Not only will it be a prettier spot, but a more serviceable one. “If the room is basically a white box,” Dixon says, “inject some architectural flair by adding a tall folding screen painted a favorite color or upholstered with interesting fabric in one corner.” Small windows not letting in enough light? Adjust the lighting and mood of the room by purchasing a few inexpensive table lamps and scattering them on the bureau top and bedside tables. A third thing to do is to pick up a few leafy, green plants for the windowsills, or if there’s sufficient space, a ficus tree. Plant it in a big urn and the entire space will both look and feel homier. The first is to install the GROHE Retro-Fit Shower System. The upgrade is quick and easy, transforming an existing standard shower into a luxurious full-shower system with both a shower head and hand shower. The DreamSpray® technology delivers even water pressure and temperature distribution while minimizing consumption. 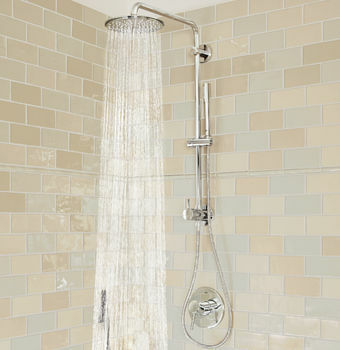 For an added bonus, the Retro-Fit is especially helpful in multi-generational homes, as the shower head and hand shower can be used simultaneously or separately. For proof-positive personalization, hang some favorite photographs or artwork. If the space is tiled, use stick-on hooks. They’re as strong as nails. If you’re not permitted to hang pictures, think about investing in a grand, nearly ceiling-height mirror and leaning it against a wall. This is a modern concept, and with the right frame, a marvelous accent for any style of furnishings that you can take with you when you go. Those who rent furnished spaces are more limited in what they can do than those who bring their own furniture. But one of the best tricks, especially if the décor is not to your taste, says Dixon, is to buy ready-made, tie-on slipcovers in white. Add an armload of colorful pillows and voila! The white ties everything together and is soothing, too, no matter what the carpeting or walls are like. Among the fastest changes one can make in a kitchen is to replace the cupboard hardware. Whether your preference is colorful contemporary, sleek and stainless, faceted crystal or any other style, new handles make a huge difference. Just be sure to get the same format as the originals currently in place, two-nail pulls or one-nail knobs. If you want to make an even bigger change, go a step further and reface the cupboard doors. For an instant style miracle, lay down an area rug made of a natural fiber such as sisal, wheatgrass, coir and jute or go the man-made route with polypropylene (PP) or recycled plastic (PET). Both can be cleaned with an outdoor hose and soap. For a stereotypical, all-white kitchen, consider a short-pile wool boldly striped in red or blue and white. What a difference and easy as pie. By making a few small but important modifications, you can make your rental feel like a personalized space. You might just decide to stay…or, bring some of the touches you added there to your new, permanent home. GROHE America’s headquarters are in the heart of New York City’s Flatiron district and houses the GROHE Live! Center, an interactive showroom created for inspiration and collaboration.